It's a dark and lonely Christmas Eve in the dining room of ancient Soul's College. The Dean of Soul's College has arrived, and the evening's ceremonies must begin.For this is the annual meeting of a secret club for those who despise children, warmth, happiness, and above all Chri... read full description below. It's a dark and lonely Christmas Eve in the dining room of ancient Soul's College. The kitchen boy, 11-year-old Lewis, has helped prepare a highly unusual meal, made with unrecognisable ingredients, cooked by a mysterious chef. And then the guests arrive ... and carnage ensues. They are ex-students of Soul's College, and they are all completely demented. They demand bottle after bottle of wine, flinging their cutlery and howling like banshees until ... silence. The Dean of Soul's College has arrived, and the evening's ceremonies must begin.For this is the annual meeting of a secret club for those who despise children, warmth, happiness, and above all Christmas. Each member must try to outdo the others by telling the most terrible, disgusting story they know.A spooky, shocking, bloodthirsty alternative to festive cheer that will appeal to, fascinate and delight young readers. 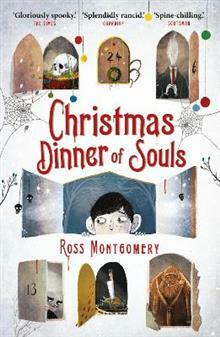 Ross Montgomery is a primary school teacher and he writes his books when he really should have been marking homework. Author of Alex, the Dog and the Unopenable Door and The Tornado Chasers, Ross has been shortlisted for the Costa Book Award and nominated for the Branford Boase Award. Perijee & Me was his third middle-grade novel. Ross lives in Brixton, London. David Litchfield lives in Bedfordshire. He first started to draw when he was very young, creating comics for his siblings. Since then David's work has appeared in magazines, newspapers, books and on T-shirts. He has also exhibited his illustrations in both solo and group shows in the UK, Europe and America. He is the author/illustrator of the award winning picture book The Bear and the Piano. The Building Boy was his first picture book with Ross.